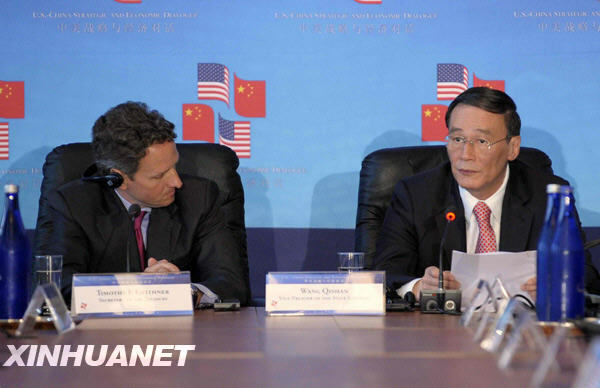 On July 28, 2009, Chinese Vice Premier Wang Qishan said that stimulating economic growth remains the primary task of China-U.S. cooperation and China and the United States should strengthen exchanges and cooperation in that regard. Wang said at the second-day economic track of the China-U.S. Strategic and Economic Dialogue that the Chinese economy has stabilized and there is an obvious trend of moving upward. Positive factors are increasing. The U.S. financial market tends to stabilize. Some positive phenomena have occurred in economic operation. The Chinese side expects the United States to speed up efforts to repair the functions of financial market, achieve an early economic recovery, and continue to play an important role in driving global economic growth. Wang said the two sides should strengthen exchanges and cooperation, have an accurate grasp of the direction and strength of macroeconomic policies, improve policies and measures in a timely manner, and promote the stable and healthy development of economy. With respect to the issue of economic restructuring, Wang said that the Chinese government, while ensuring growth, focused on expanding domestic demands, especially consumer demands, deepening the reform and opening up, advancing economic restructuring, and protecting and improving people's livelihood so as to achieve the harmony of speed, structure, quality and benefit. China's response to the financial crisis shows that China is fully capable of stimulating economic growth by expanding domestic demands when the external demands shrink. But Wang also stressed that for both China and the United States, the transformation of economic development pattern is not an easy thing, which requires long and arduous efforts. He expressed the hope that China and the United States should strengthen cooperation in this regard. Wang also pointed out that in today's world, the economic imbalance within a country, between nations and between regions, and even the global economic imbalance are a result of the imbalance in development. Therefore, promoting the sustainable development of national, regional and global economy is what really matters. At the same time, against the wave of economic globalization, the international community should make joint efforts to effectively narrow down the development gap between the North and the South and focus upon the interests of developing countries, especially the least developed countries.